J.K. Rowling’s been in the media recently after releasing a new Harry Potter short story in July and when she wrote a letter from Dumbledore to the 15-year-old survivor of the Texas shooting (is she amazing or what?). And since she’d one of my favorite authors, I thought it’d be nice to learn a little more about this incredible imaginative mind and how she started the writing career that led to the Harry Potter series. 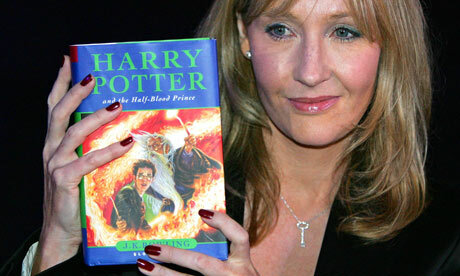 Bio: Joanne “Jo” Rowling, is a British novelist best known as the author of the Harry Potter fantasy series. Born in Yate, Gloucestershire, Rowling was working as a researcher and bilingual secretary for Amnesty International when she conceived the idea for the Harry Potter series on a delayed train from Manchester to London in 1990. The seven-year period that followed saw the death of her mother, divorce from her first husband and relative poverty until Rowling finished the first novel in the series, Harry Potter and the Philosopher’s Stone in 1997. There were six sequels, the last, Harry Potter and the Deathly Hallows in 2007. Since then, Rowling has written three books for adult readers, The Casual Vacancy (2012) and—under the pseudonym Robert Galbraith—the crime fiction novels The Cuckoo’s Calling (2013) and The Silkworm (2014).